About this Virtual Run: Help us raise enough money for Make-A-Wish to grant a couple of wishes for kids diagnosed with life-threatening medical conditions by participating in the Shamrock Shaker virtual 5k/10k/Half Marathon. You can run or walk whenever and wherever you want to support the cause! 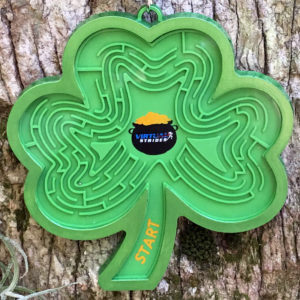 All participants will receive a custom digital race bib and the most unique medal we have ever made, this 4″ clover-shaped maze game. There is a tiny ball enclosed inside the medal, and there are two different ways to solve the maze. Reaching the Pot of Gold at the center of the medal is harder than it looks! About the Charity: On average, Make-A-Wish grants a wish every 35 minutes. Wishes are more than just nice thing. A wish experience can be a game-changer for a child with life-threatening medical condition. Wishes impact everyone involved – wish kids, volunteers, donors, sponsors, medical professionals and communities. For wish kids, just the act of making their wish come true can give them the courage to comply with their medical treatments. Parents might finally feel like they can be optimistic. And still others might realize all they have to offer the world through volunteer work or philanthropy. Whatever the odds, whatever the obstacles… wishes find a way to make the world better.